If you have been working through this series about SharePoint-hosted add-ins, you have a Visual Studio solution that you can use to continue with this topic. You can also download the repository at SharePoint_SP-hosted_Add-Ins_Tutorials and open the BeforeColumns.sln file. You'll find it a lot easier to develop SharePoint-hosted SharePoint Add-ins if you are familiar with how users deploy and install your add-ins. So, in this article, we'll take a brief break from coding to create and use an add-in catalog, and then install the add-in you've been working on. Sign in to your Office 365 subscription as an administrator. 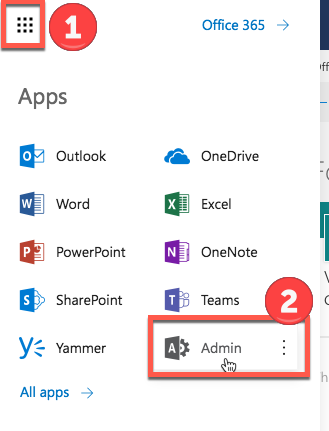 Select the add-in launcher icon, and then select the Admin tile. In the Admin Center, expand the Admin centers node in the task pane, and then select SharePoint. In the SharePoint Admin Center, select apps in the task pane. On the App Catalog Site page, select OK to accept the default option and create a new app catalog site. In the Create App Catalog Site Collection dialog, specify the title and website address of your app catalog site. We recommend that you include "catalog" in the title and URL to make it memorable and distinguishable in the SharePoint Admin Center. Specify a Time Zone and set yourself as the Administrator. Set the Storage Quota to the lowest possible value (currently 110, but that can change), because the packages you upload to this site collection are very small. As the site collection is being created, SharePoint takes you back to the SharePoint Admin Center. After a few minutes, you'll see that the collection has been created. Open the Visual Studio solution, right-click the project node in Solution Explorer, and then select Publish. In the Publish pane, select Package the add-in. The add-in is packaged and saved as an *.app file in the solution's \bin\debug\web.publish\1.0.0.0 folder. Open your add-in catalog site in a browser, and then select SharePoint Add-ins in the navigation bar. Select add an add-in to open the Your Add-ins page. Find the Employee Orientation add-in in the Add-ins you can add section, and select its tile. Select Trust It in the consent dialog. The Site Contents page automatically opens and the add-in appears with a notation that it is installing. After it installs, users can select the tile to run the add-in. In the Site Contents page, move the cursor over the add-in so that the callout button ... appears. Select the callout button, and then select REMOVE on the callout. Navigate back to your add-in catalog site and select SharePoint Add-ins in the navigation bar. Highlight the add-in and select manage on the task bar just above the list, and then select Delete on the manage menu. We strongly recommend that you continue with this series about SharePoint-hosted add-ins before you go on to the more advanced topics. Next, we get back to coding in Add custom columns to a SharePoint-hosted SharePoint Add-in.